Like a lot of people my age who used to do the pogo in a drunken stupor at Ramones shows, and listen to The Velvet Underground and Eno and Pere Ubu with all the intensity of a presidential anesthesiologist, finding new music that I like can sometimes be hard. Every once in a while, a new band I catch at the House of Blues or some other Boston-area swillhole will get a thumbs-up—like the time I stumbled on The Rifles at Scott’s and became an instant devotee. But more often, I take pleasure in keeping up with the latest from Eno and Ubu and Mission of Burma and The Feelies and other bands whose music and live shows have reserved parking spots in my head and heart. So it was only natural that I went to see the Feelies perform last September at The Sinclair in Cambridge. I’d taken in their 3-hour show in Pawtucket in April and nothing, save the city of Boston being ordered to “shelter in place” again, was going to keep me from attending their performance in Cambridge. (Which was another 3-hour gleefest, by the way—and one that will be repeated on Friday, May 30 at The Sinclair.) During the intermission that night, I struck up a conversation with the guy working at the Feelies’ merch table—Bob Torsello. And he gave me a tip on a great band I hadn’t heard of before: his band, Shrubs. A few weeks later, Bob sent me some Shrubs CDs. And from the first playing, I was amazed and surprised and more than a little intrigued. Who were these guys who had created these songs that were wearing out my replay button? It turns out that Shrubs is a three-man band that released its first album in 1995 and is still actively performing and recording. (A new album is in the making right now.) Comprised of bass player/vocalist Bob Torsello, guitarist/vocalist Jay LoRubbio and drummer Rob Takleszyn, the Shrubs resist categorization the way Route 128 resists rush-hour speeding. The band got its start in the Hudson Valley of New York and in central New Jersey—primarily in the New Brunswick area, where they were part of an active music scene well documented by New Brunswick Underground. The band has issued five albums—Pickled Children, 1995; Somebody’s Watching, 1996; Zod, King of Spoons, 1997; Misfits & Dreamers, 2001; and Forgotten How to Fall, 2009). They’re albums with a mix of songs that are nothing if not diverse. As you listen to them, part of the delight is that from one album and one track to the next, you have no idea what to expect. There are pop-flavored ballads (“A Man Needs Love” and “Deeper Love”), balls-out rock anthems (“Gotta Go” and “Through the Hedge”), proto-punk grinders like “Miss/Conception” and “Find a Way,” experimental (and somewhat extraterrestrial) tunes like “Stupid,” and “Space Thrust”—and just about everything in between. “Julie Head Nurse” feels like a tilted Beach Boys song. “Me and You” and “Here We Go Again” sound like the kind of songs the Beatles might be recording if they were still around. While “Nothing Left to Lose” suggests The Clash, and “Who Did You Kill Today” feels like a cross between Iggy Pop and The Raybeats, updated for the 21st Century. The Shrubs are not any of those bands, thankfully. They’re their own men. But their range is impressive and more than that, it makes their music a lot of fun to listen to. The glue that binds together these disparate styles is composed of many elements. Their precise (but not overproduced) instrumentation. Their thoughtful vocals and smooth harmonies. The earnestness of the songs’ delivery. Shrubs music demands attention, and is surprisingly rich and full for a three-man band. LoRubbio’s guitar flits and dances and stings and at times attacks; one minute his steady chord treatments are providing a melodic backdrop, the next he’s channeling Gang of Four’s Andy Gill and cutting the air with notes that leave blood on the stage. Torsello’s hypnotic bass playing and Takleszyn’s slick drum work are equally compelling and inventive; Shrubs tunes accordingly propel themselves along at an often joyous and always cohesive clip. 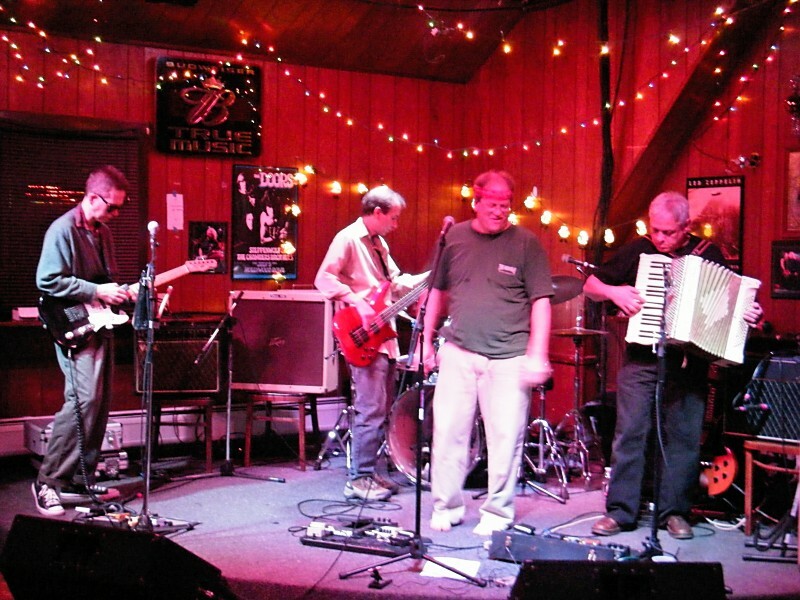 The Shrubs play pop, folk, rock, songs that echo punk and songs that take old notions of new wave to much newer places. And one of the things I like most about the band is that every song seems to be exactly the right length. None of them drag on. None of them feel unresolved. They’re little jewel boxes of songs, perfectly constructed like folk-art versions of Fabergé eggs. The band has played extensively in New York, New Jersey, the mid-Atlantic—and beyond. It thrilled (and possibly perplexed) audiences in the U.K. during a tour that saw the boys play at the famous Cavern Club in Liverpool. 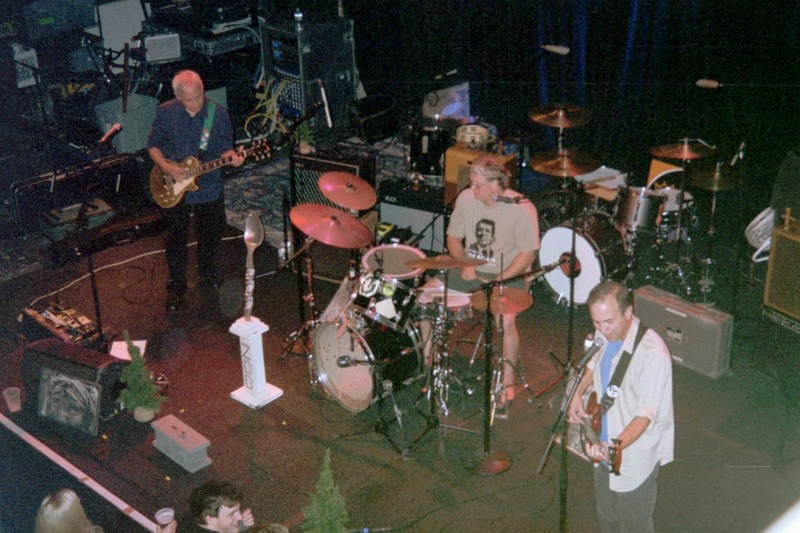 Shrubs opened for the Feelies during that band’s reunion shows in 2008 and 2009. The trio also has also appeared in shows with kindred spirits Pete Seeger and Wake Ooloo. 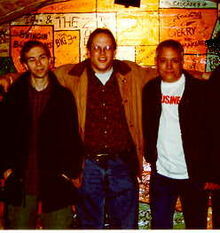 Crossing paths with Wake Oooloo in the early days was how Torsello met the guys from the Feelies in the first place. When the band released Forgotten How to Fall in 2009, it showed not only the band’s range but also its maturity. The album, which was co-produced and mixed by the Feelies’ Glenn Mercer (who also contributed guitar, percussion and keyboard parts), debuted at The Tuscan Café in Warwick, N.Y. to a no-doubt astonished and appreciative audience. Songs like “Don’t Put My Name on It,” “I’m Alive” and “Did You Ever See Me” are the kind of rock tunes you want to play three or four times in a row to make sure you heard what you thought you heard—and to ensure that you didn’t miss anything. Other tracks tackle issues head-on, with all the subtlety of a steroid-crazed linebacker, like the discussion of peace and destruction that takes place in “If I Had a Dream.” Then there are songs that only a band like the Shrubs could ever record, like “Stupid.” (“Stupid, I am stupid, ‘cause I fell for you… What can I do? I fell for you.”) It’s fun, and funny, and also sad, and the Eno-esque accordion part that LoRubbio plays (an addition suggested by Mercer) gives the song a dirge-like quality that’s downright funereal and at the same time weirdly uplifting. How do they come up with this stuff? Torsello described the process this way: “In the early days, when we were all based in New York State, we got together almost every week, and we tended to write things collectively. Songs evolved out of jams and spontaneous poetics. Now, basically, one member brings a sketch of a song to a rehearsal and others offer suggestions. So everyone has input into the final arrangement. Nothing is planned—we don’t try to write consciously in any style.” Torsello credits “everything that came before us” as influences for the band, and singles out The Beatles, The Grateful Dead, Neil Young, The Kinks, The Who, Frank Zappa, Patti Smith, The Clash, The Ramones, The Minutemen, the Feelies, King Crimson, and Eno as several of note. If you listen closely, you can probably hear echoes of all of those artists in the Shrubs’ music. And I suggest you do. Sadly, you won’t find Shrubs music on iTunes. “We’re a pretty old-fashioned band that never fully embraced the digital age,” Torsello says. But the band does have a MySpace page and a Facebook page with some of its music on them. There are also a few YouTube videos that you can see here, here, and here. The band played a few gigs on WFMU, too, and there are recordings of those studio-performed songs here. You should definitely give them a listen. 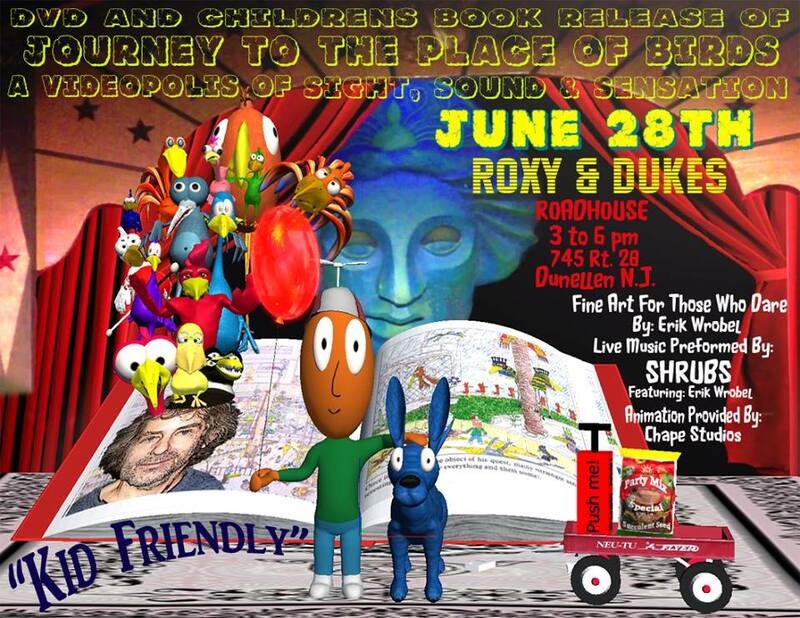 And if you’re in the Dunellen, N.J. area on June 28th, don’t miss the opportunity to see The Shrubs perform at Roxy & Dukes Roadhouse. It’s an afternoon, all-ages show—which is only fitting for a band whose music hearkens back to so many great musical memories from yesteryear, while at the same time creating new ones of its own. They’re the perfect “new” band for you to discover on this Memorial Day weekend.